Zürich, Braginsky Collection, B45: Salomo ha-Adani, Melekhet Shelomo („die Mischnah-Kommentare des Salomo“) (http://www.e-codices.ch/de/list/one/bc/b-0045). Adeni labored on this Mishnah commentary for thirty years. He wrote it originally in the margins of the printed Mishnah edition he owned. The comments were so crowded that, after a while, the author had difficulty deciphering his own handwriting. A patron presented him with reams of paper to enable him to transcribe his notes into a coherent work. 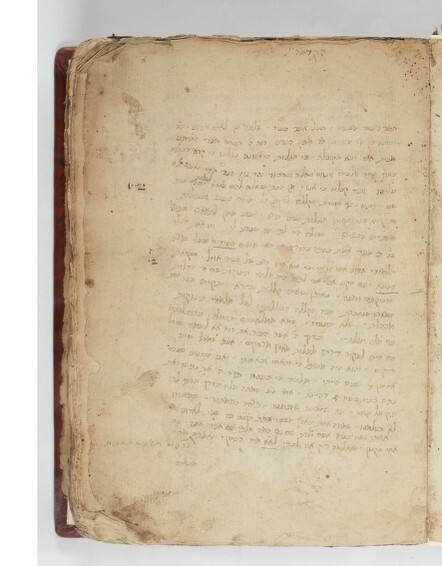 The manuscript on display here is one section of this book, which covers the first order of the Mishnah, Zera'im, which deals with blessings, prayers, and agriculture-related laws. Corrections, additions, and erasures by the author are clearly visible in the manuscript. Another part of the book, on the sixth order of the Mishnah, Tohorot, is dated 1611 (New York, The Library of The Jewish Theological Seminary, MS Rab 33). Rabbi Solomon Adeni’s contributions to the study of the Mishnah are manifold. He endeavored to establish the correct text and vocalization of the Mishnah and preserved traditions concerning the text that otherwise would have been lost. He apparently had access to libraries of manuscripts of medieval rabbinic works in the Talmudic academies of Jerusalem, Safed, and Hebron, and incorporated excerpts from them into his commentary. Furthermore, he included exhaustive discussions of his own on many passages. Far from European centers of Jewish learning, Adeni was able to create a work of lasting importance. Although not published until the end of the nineteenth century, the Melekhet Shelomo is found today in many standard editions of the Mishnah and is being studied diligently by new generations of students. From: A Journey through Jewish Worlds. Highlights from the Braginsky collection of Hebrew manuscripts and printed books, hrsg. E. M. Cohen, S. L. Mintz, E. G. L. Schrijver, Amsterdam, 2009, S. 92. From: A Journey through Jewish Worlds. Highlights from the Braginsky collection of Hebrew manuscripts and printed books, hrsg. E. M. Cohen, S. L. Mintz, E. G. L. Schrijver, Amsterdam, 2009, p. 92-93.